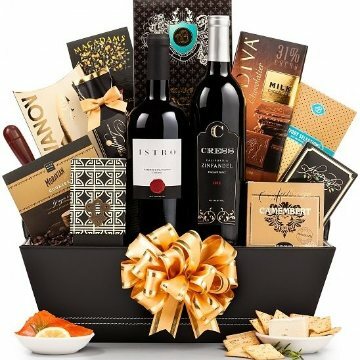 A perfect balance of food and wine, this upscale gift basket first impresses with the prestigious selection of two acclaimed red wines: Maryhill Winemaker's Blend and Terra D'Oro Amador Zinfandel. This gift basket includes the following: Auberge Camembert Cheese Spread 3.75 oz, Cheese Spreader, Aaron Bell Almonds 1.5 oz, Aaron Bell Sesame Stix 4 oz, Saraivanov Smoked Salmon 4 oz, Macadams' Lemon Tea Cookies 2 oz, Aaron Bell Crackers 4 oz, Toffee Peanuts 2 oz, Godiva Milk Chocolate Tablet 3.5 oz, Moravian Chocolate Dipped Spice Cookies 1 oz. Measures 19" x 14" x 12". If any substitutions are necessary, they will be made with items of equal or greater value. Please note that this gift is only available for purchase and receipt by persons over 21 years of age.